ACO Aquaduct's division specializes in custom drainage solutions and offers products made from FRP (fiberglass reinforced plastic), stainless steel and other materials. 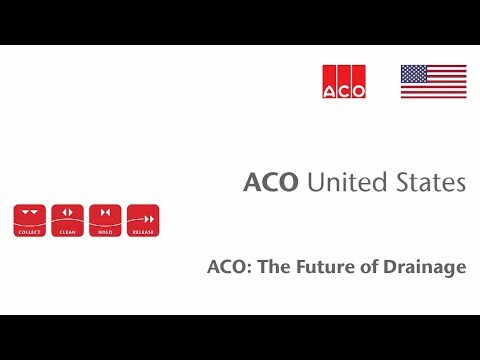 ACO Drain systems consist of manufactured modular trench drains made from stainless steel, corrosion resistant polymer concrete, or fiberglass, together with grates from a variety of materials for all loading applications. Aquaduct engineers are involved from the outset providing industry knowledge and experience to design solutions that meet specific site requirements within the project budget. On-site technical service during installation is a valuable part of the process. Aquaduct solutions are used extensively by industries such as: chemical manufacturers, food processing plants, auto manufacturers, container terminals and airports. Aquaduct is a custom designed and manufactured solution for drainage systems with special requirements that cannot be met by standard products. Some of those requirements can be one or a combination of the following: hydraulic capacity, design layout, custom depth, custom width, custom length, installation restrictions, chemical resistance, heat resistance, abrasion resistance and fire retardant. Groundwater protection is a major concern in most chemical processing and industrial environments, and EPA regulations require double containment to prevent leaks and spills from contaminating water tables. Aquaduct provides the industry with an innovative solution, combining the convenience of a trench drain with the safety and security of a double contained pipe. Leak Detection Port - removable lid allows for visual confirmation and can be positioned at various low points around the system. Aquaduct offers a solution for very long runs that allows the fiberglass former to be reused to create a trench drain with poured concrete. This system allows special projects to stay in budget and have a quality product.